Frankfurt 2009: Mercedes E-Class Estate | What Car? The latest version of Mercedes posh load lugger, the E-Class Estate. 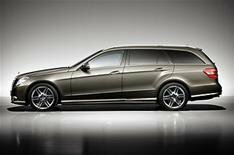 Mercedes makes no apologies for the size of the E-Class Estate, which is being shown for the first time at the Frankfurt motor show. The Germans say it is the biggest estate of its kind, with a maximum 1950 litres of cargo space. Thats more than its key rivals, the BMW 5 Series Touring and Audi A6 Avant. The car's design is meant to convey this. Blacked-out central roof pillars create the look of a long arch running from front to rear, while the horizontal rear lamps emphasise the car's width. The E Estate is not only big, but it's also clever. There's an automatic-opening tailgate, which pulls the luggage cover out of the way as it lifts, quick-fold rear seats that can be lowered from the boot or the inside of the car, and a folding load compartment floor that allows taller cargo to be carried. There's self-levelling rear suspension with air springs at each corner and adaptive damping. Mercedes claims this guarantees a smooth ride and level handling regardless of the amount of weight in the boot. The car arrives in the UK early next year and has all the safety and fuel-saving advances already seen on the E-Class saloon and Coup. A drowsiness-detection monitor, automatic emergency braking when a shunt is unavoidable, a pop-up bonnet to protect pedestrians in a collision and headlights that automatically switch between full and dipped beam will be available, and nine airbags are standard. At launch there'll be a choice of two 2.1-litre diesels, a couple of petrol 1.8 turbos, a 3.5-litre V6 and a 5.5-litre V8. A V6 diesel and the high-performance AMG model will follow soon afterwards. There'll be the same three trim packages adopted for the saloon, with a likely premium for the Estate of at least 1000, which should mean a starting point of around 29,250.